Amongst the thousands of graves in the churchyard at Cadoxton, the most famous or infamous is undoubtedly the Murder Stone. Murder Stones served as an appeal to conscience and the one in Cadoxton was intended to attract the attention of the murderer. The primary message addressed to him is that he should give himself up as a matter of conscience. The secondary message is a warning to others of a similar violent disposition. When the stone was erected there was no wall around the churchyard and anyone passing on the turnpike road would have been able to read the message. 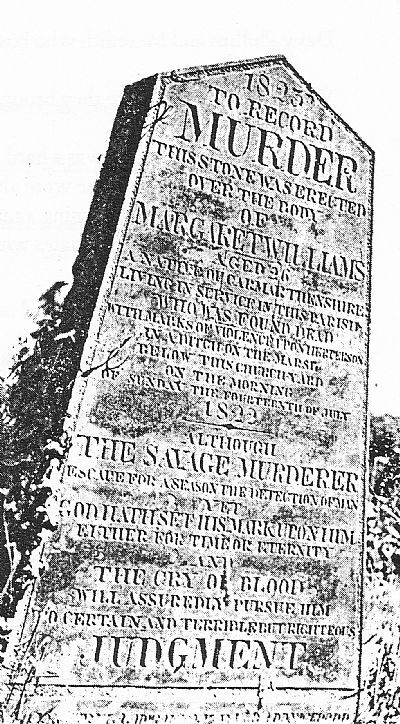 The stone was erected a year after the murder in 1823. The memorial reads: “Although the savage murderer escaped for a season the detection of man, yet God hath set his mark upon him either for time or eternity and the cry of blood will assuredly pursue him to certain and terrible but righteous judgement.” This was a genuine attempt to put the ‘Fear of God’ into the murderer! The stone is not unique. There are many stones dealing with the victims of murder; but the St. Catwg’s stone is a very rare example of a Murder Stone where the assailant is never identified. There is a similar stone at Nebo Chapel, Felindre (Llangyfelach). Erected in 1832 the inscription no doubt took its inspiration from the Cadoxton stone as some of the wording is identical. The murder took place on Saturday 13th July 1822 but the stone was not erected until the following year. Some say it was placed alongside the path at a particular angle so that it pointed towards the farm where the chief suspect lived. However, it is obvious that the stone is placed no differently to others alongside the path. The cost of producing the monument was paid for by George Tennant of Cadoxton Lodge who, at this time, was well advanced in the building of the Tennant Canal (opened May 1824). Was this a public relations exercise? The author of the verse on the stone was Elijah Waring (1788-1857). He was originally a Quaker and had moved to Neath in about 1814 from Alton in Hampshire. Waring married a daughter of Peter Price of the Neath Abbey Iron works. He lived at Plas-y-felin, next to the Neath river bridge, and owned Melin-y-bont, the mill adjoining his property. He is best remembered for his “Recollections and Anecdotes of Edward Williams, the Bard of Glamorgan” (Iolo Morganwg) which was published in 1850. His daughter Anna Letitia was a well-known hymn writer who joined the Church of England. Elijah Waring’s son, Charles, lived at Darran, Longford, and wrote a Handbook of Neath although it was published anonymously. Margaret Williams was a 26 year old young woman from Carmarthenshire who worked as a maid on a farm above Cadoxton. She became pregnant and left the farm – we don’t know if she left of her own accord or was thrown out. The son of the farmer was arrested. He was known to be the father of the child and he was immediately suspected of her killing. On Tuesday the inquest started in Neath (things moved far more quickly in those days). The jury were kept in over-night but the following day it was found that there was not enough evidence to charge the young man and he was released. Cadoxton and indeed, Neath, may have been small places in those days, but probably everybody knew everyone else’s business. Suspicions and feelings ran high and it is said that the young man left for a new life in America. Fifty years after the murder a book was published in Merthyr which raised fresh questions about the killing. The author, Charles Wilkins, was a postmaster and librarian in the town and a respected historian having written a history of the town of Merthyr Tydfil and many other history books. In it Wilkins repeats a version of the Cadoxton tragedy and ends with a death-bed confession from a man named Parry. Parry alleged that he had always taken a fancy to Margaret Williams but she had not returned his advances. On this particular Saturday night he had seen Margaret with her boyfriend. When they parted he once more tried his luck only to be repulsed. Frenzied with passion he killed her. Was this a true story? Or was it an editorial addition aimed at selling more books? The names have been changed, the place of the murder is different and even the means of the killing has been altered. The tale as told by Charles Wilkins has certainly been re-arranged to grab the attention of the readers. There is one more piece of information of interest relating to this murder. The Neath Fair in the late 19th and early 20th centuries featured plays put on by the Haggar family. William Haggar and Jack Desmond wrote, ‘The Fair Maid of Neath’, which outlined the heinous crime. Haggar’s father, also named William, was a pioneer film maker in South Wales. The Murder Stone occupies a prominent site on the main pathway to the church entrance and is well known throughout the Neath area. The stone is well maintained and flowers are often laid there. The murder itself will probably never be detected now but as long as the stone stands its story will live on. This adds a lot to the previous story as there is no other record of anyone being charged. It also means positive identification of the farm involved as Gellia. The Richards family were living there at this time and the Cadoxton baptismal record for 17th January 1823 shows when Llewellyn, reputed son of Llewellyn Richards and Gwenllian Llewellyn was baptised. If the latter is, as it seems, the same man who was later charged, then it appears that he was involved with several women and perhaps that is why Margaret Williams had to leave the farm. The child Llewellyn died later in 1823 but Gwenllian and Llewellyn Richards of Gellia were married in 1829. This refutes the suggestion that he escaped to America (unless he went after that time). The Richards family continued to live at Gellia until the 1860s.